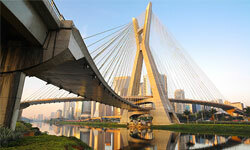 Earn up to 9 credits when you study with AIFS in São Paulo, Brazil. AIFS in Sao Paulo offers a unique Portuguese Language curriculum, designed for students who want to begin or strengthen their skills in Portuguese, or study the business environment and economic development of Brazil. You may choose to live in a homestay or a shared student house, meal allowance included. Enjoy cultural activities like guided historical tours, museum visits, and Brazilian dance classes. Day trips to Juquehy, Embu das Artes are included, and AIFS offers an optional 3-day excursion to the exhilarating city of Rio de Janeiro.